More of the practice puzzles I wrote for Team India. This variation was in the WPC and IS pretty puzzly, but I’m pressed for time and this solved the purpose of a Sudoku post. Remember that you can solve the puzzles from the League online on the Sudokucup Guest League page with a 24h delay. However, I spoke to Karel and chances are this one might not be interface friendly. Do check in tomorrow if you want to though, just in case. 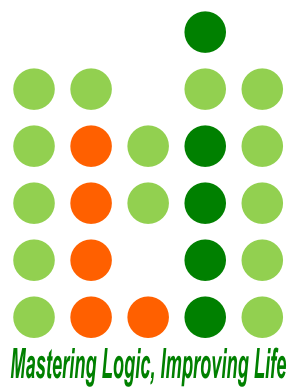 Enter whole numbers between -4 and +4, inclusive, into the grid so that each row, column and region contains all possible numbers exactly once. 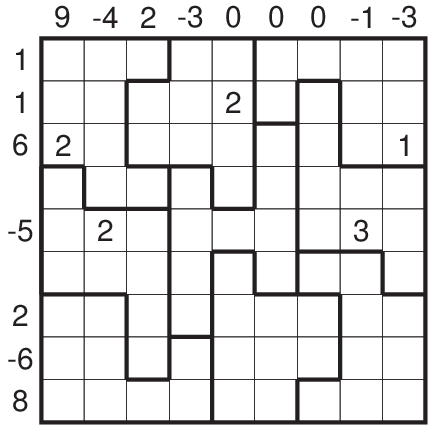 Clues outside the grid indicate the sum of all numbers that appear between the clue and the cell containing zero in that row/column. Some cells already contain a number. However, the signs for these clues are not indicated, it is part of the puzzle to determine whether they are positive or negative values.